Zhenzhong Si, QE Scholar with the Hungry Cities Partnership, publishes a book “Organic Food and Farming in China: Top-down and Bottom-up Ecological Initiatives” coauthored with Steffanie Scott, Theresa Schumilas and Aijuan Chen. This book shows how a set of social, economic, cultural, and environmental conditions have converged to shape the development of a “formal” organic sector, created by “top-down” state-developed standards and regulations, and an “informal” organic sector, created by ‘bottom-up’ grassroots struggles for safe, healthy, and sustainable food. This is generating a new civil movement focused on ecological agriculture and quality food. 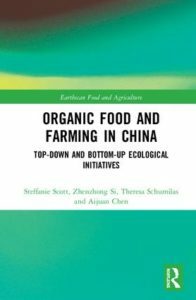 The authors contrast western industrialized food system with the Chinese context, with its unique version of “capitalism with social characteristics,” collective farmland ownership, and predominance of smallholder agriculture and emerging diverse marketing channels. China’s experience also reflects a commitment to domestic food security, evolving food safety legislation, and a civil society with limited autonomy from a semi-authoritarian state that keeps shifting the terrain of what is permitted. The book will be of great interest to advanced students and researchers of agricultural and food systems and policy, as well as rural sociology and Chinese studies.